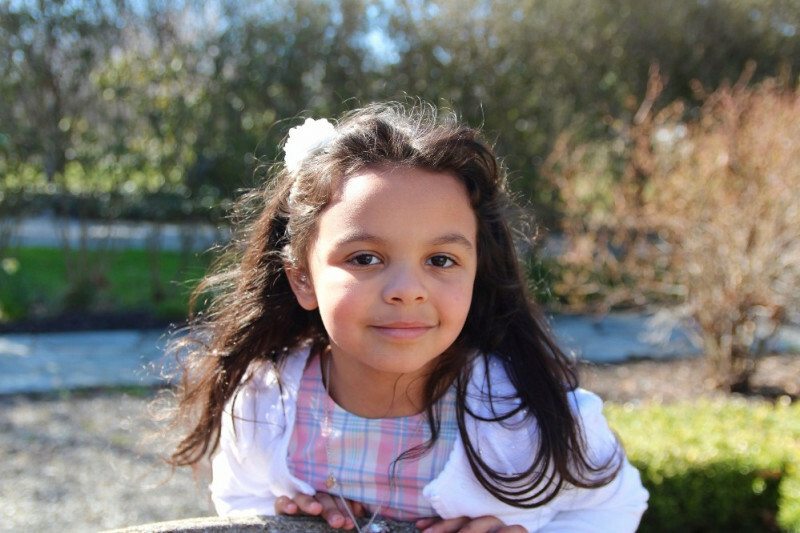 The party was one of the easiest we have thrown for one of the kids. 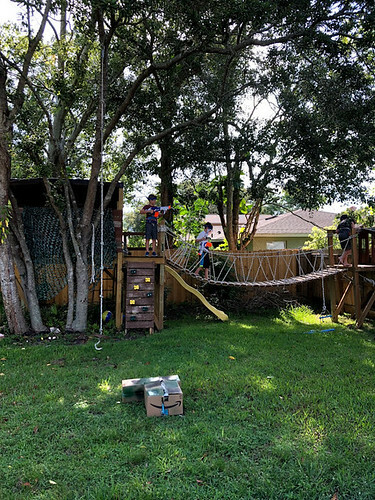 It was simple to create, cheap to put together, and a whole lot of fun for the boys. I got so many of my ideas from Pinterest, so here is the link to my Pinterest board that has all my pins. First, we sent out these super cute invitations that I made in Canva. I downloaded the image to my phone and then texted it to all the mom’s of the boys we were inviting. So much easier than paper invitations and they can’t get lost! 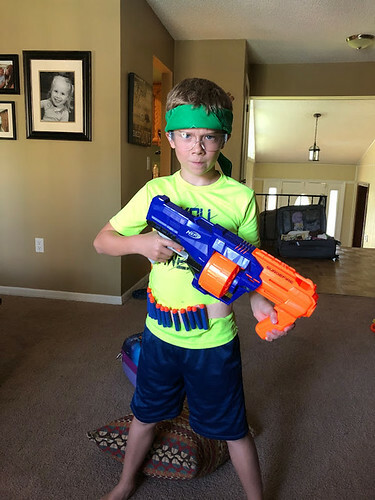 I scoured Pinterest to find what the best Nerf battle games were to play and it was a hands down winner of Capture the Flag. Bean and I went to Walmart and bought two different color bandanas so that we could mark each team and I ordered safety goggles from Amazon. 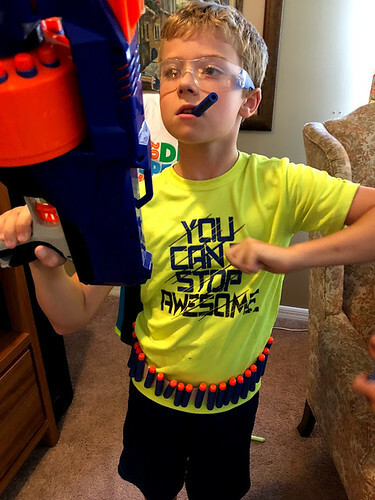 I also found a super easy way to make Nerf bullet belts, by simply putting duct tape around the kids waists inside out. The ammunition stuck to the tape, but it was still easy and quick to remove in the middle of the battle. When they wanted to take them off, Chris and I cut them. They were a big hit. As everyone arrived, we had them put their initials on their guns with a Sharpie marker so that we didn’t get anyone’s guns confused. We also had them empty out any of the bullets they brought from home so that they didn’t lose those. I ordered 500 bullets from Amazon, so we used those during the battle. 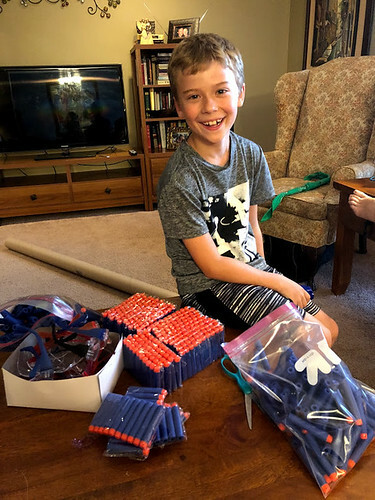 We had everyone load up their guns and their ammunition belts before the battle. 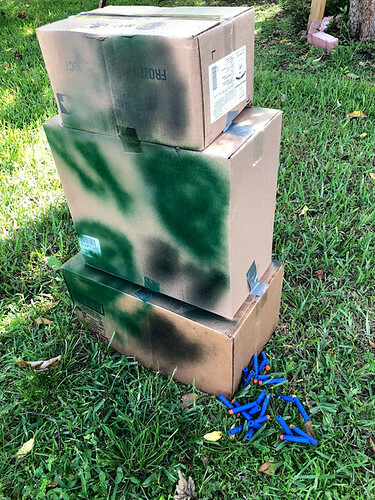 We also put piles of ammunition at the base of each blockade so they could reload out on the battlefield, if they needed. If they got somewhere and couldn’t find any ammo, they could raise both their hands in the air and Chris and I would bring them bullets out to the battlefield and they couldn’t get shot as long as their hands were up. But with the piles of bullets at the base of each blockade, we only had to do this once or twice. And, of course, there was ammunition laying all over the place from the battle, so that helped, too. 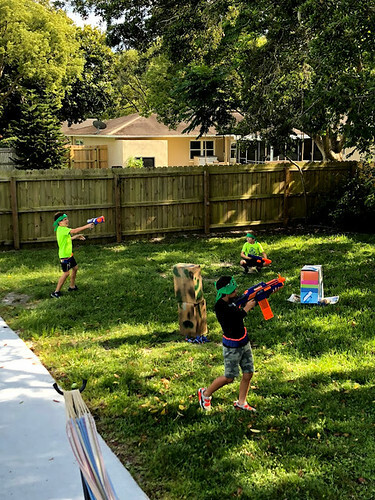 For the battle itself, we divided the boys into two teams of three and gave each group a side of the yard as their base. Each team took a turn hiding their flag while the others faced the opposite direction. Then, everyone had to line up against the fence on their side of the yard until I yelled, “THREE…TWO…ONE…BATTLE!” And then they went at it! 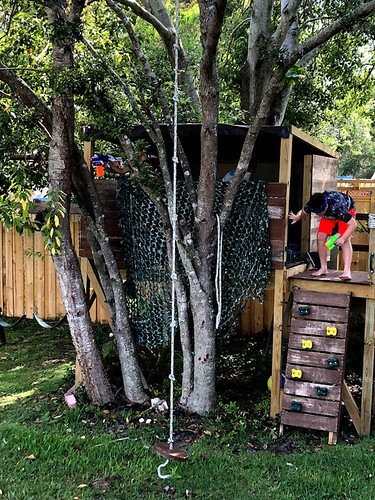 It definitely wasn’t the strategic battle I pictured on my Pinterest feed, but the boys had a great time and seemed to have their own objective and rules for capturing the flags. Our general rules were that once you got shot, you had to go back to your starting fence and start over again. For the most part, they were pretty good about doing this. Sometimes, they needed us to referee some of the hits, but that wasn’t a huge deal. In general, they were just having so much fun, they didn’t really care if they got shot and had to start over or not! 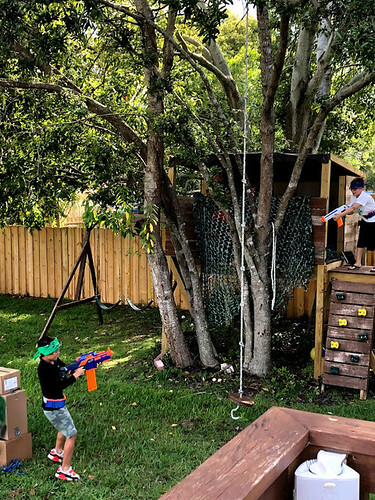 Our backyard has the kids awesome treehouse on one side, so we made sure that for every round of the battle, we switched sides of the yard so that everyone had a chance to defend the treehouse. Each battle took about 15-20 minutes to play before someone got the flag. Then, we would switch sides once and after we had switch sides once, we picked new teams and did the same thing over again. After a few rounds, the kids were hot and sweaty, so we switched to water gun battles in the pool. No rules or games there. 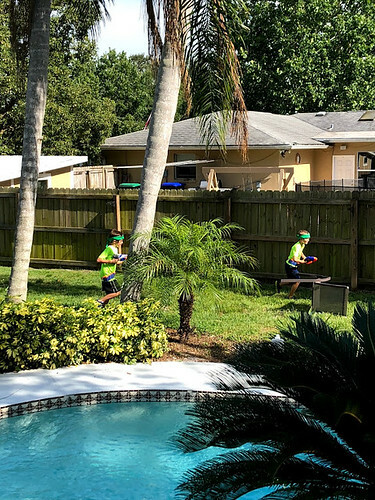 They just shot each other for half an hour or so, and then they all jumped out and wanted to keep playing Capture the Flag. We stayed outside playing from 5:00 until about 8:00. I was amazed that it kept them entertained that long! We paused for a bit at 7:00 to eat pizza and then they wanted to go back out and play more. Then, we paused a bit more for cake and presents before they went back outside for another last round before we came in for the night. 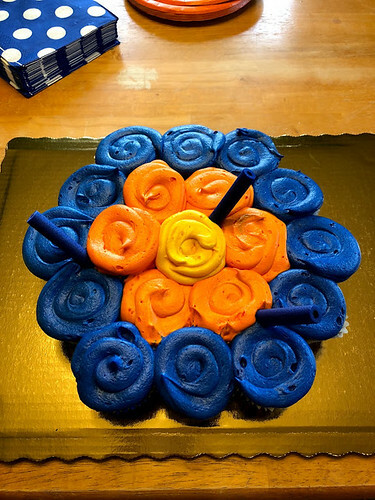 I found this picture of the cake on Pinterest. I printed it out and took it to the Publix bakery. They did such a great job! I added some bullets and it looked just like the picture! When it was dark and we were finally in for the night, we put a movie on downstairs for the boys until about 10:30. By then, Chris and I were tired and I know the boys were exhausted, so we got out sleeping bags and got ready for bed. 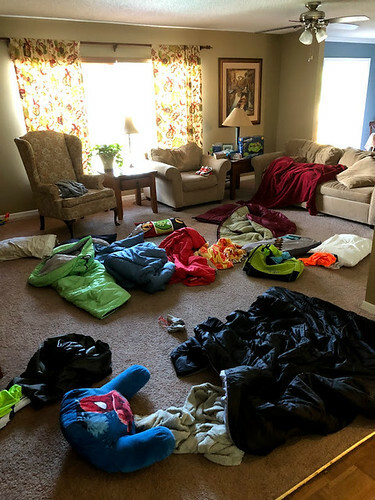 The boys slept in our living room because there was more room, and they all fit really well. We had the lights out by 11:00 and most of the boys fell asleep by midnight. We had one boy go home in the middle of the night, but that’s pretty common at this age. In fact, I was surprised more didn’t go. 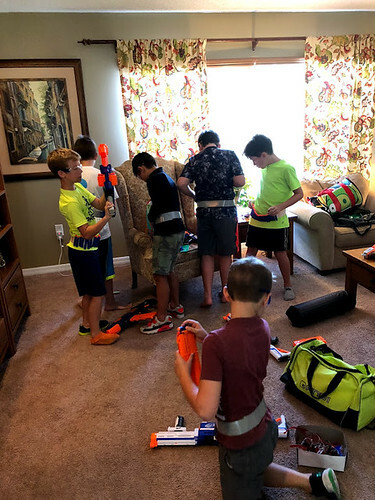 It was a really fun birthday party and I would definitely recommend it for a boy’s birthday party. We all had a great time! 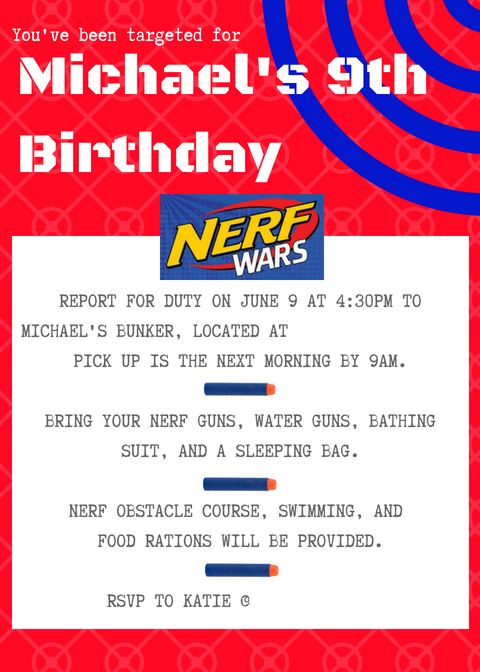 The post Nerf War Birthday Party appeared first on .